KIEV, Ukraine -- President Poroshenko, accused by Mikheil Saakashvili of corruption, deprives former ally of citizenship by decree. Saakashvili was as once a natural ally for President Poroshenko. Mikheil Saakashvili has been stripped of his Ukrainian citizenship, meaning he is now stateless, according to the former Georgian president and Ukrainian state media. Ukrainian President Petro Poroshenko, whom Saakashvili has accused of perpetuating entrenched corruption in the former Soviet republic, deprived him of citizenship by decree, Ukrainian state media reported on Thursday. "Poroshenko decided to deprive me of my citizenship in an underhanded way, while I am out of the country!" Saakashvili wrote on his Facebook page. Russian state media reported that Saakashvili was in the US at the time. Saakashvili, president of Georgia for nearly a decade until 2013, is wanted on charges of abuse of office, claims that he has denounced as politically motivated. He lost his Georgian citizenship in 2015. "I have only one citizenship, that of Ukraine," Saakashvili said in the Facebook post. 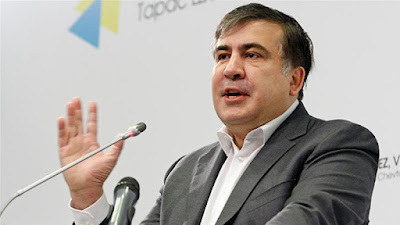 Saakashvili had been building a new political career in Ukraine after President Petro Poroshenko appointed him as governor of the Odessa region in 2015. The ex-Georgian leader, whose country fought a war with Russia in 2008 and who is loathed by the Kremlin, was once a natural ally for Poroshenko after Russia annexed Ukraine's Crimea region in 2014. However, Saakashvili, who served as Georgian president from 2004 to 2013, has become one of Poroshenko's most vocal critics, casting doubt on the Western-backed Kiev government's commitment to tackling entrenched corruption. Saakashvili resigned last November, citing opposition to reform, and set up a new political party. Attacking Poroshenko's record on reforms, Saakashvili said: "Today the entire country has understood the price of your promises to live anew". Poroshenko's administration did not immediately comment on the decision to strip Saakashvili of his citizenship.